Asgard archaea form a well-supported group with the eukaryotes in the tree of life. In a new study, published in Nature, an international research group led from Uppsala University presents the discovery of a group of microbes that provide new insights as to how complex cellular life emerged. The study provides new details of how, billions of years ago, complex cell types that comprise plants, fungi, but also animals and humans, gradually evolved from simpler microbial ancestors. Life on our planet can be divided into three major groups. Two of these groups are represented by tiny microbes, the Bacteria and the Archaea. The third group of organisms comprises all visible life, such as humans, animals, and fungi – collectively known as eukaryotes. Whereas the cells of bacteria and archaea are generally small and simple, eukaryotes are made up of large and complex cell types. The origin of these complex cell types has long been a mystery to the scientific community, but now an international collective of researchers led by Uppsala University has identified a group of microorganisms that provides a unique insight into the evolutionary transition from simple to complex cells. Based on pioneering work from the acclaimed biologist Carl Woese, it has been known that eukaryotes at some point shared a common ancestor with archaea. It was also clear that symbiosis – a process involving an intimate collaboration between two cell types – played an important role in this process. Most scientists share the view that a symbiosis in which an archaeal host cell took up a bacterium ultimately gave rise to eukaryotes. Yet, whether this symbiosis was the cause or rather the consequence of the evolution of complex cells remained an open question. In this weeks’ edition of Nature, researchers from Uppsala University in Sweden, along with collaborators from the USA, Japan, Denmark and New Zealand report the discovery of a new group of Archaea, the Asgard archaea, which reveal important details on how eukaryotic cells evolved their complexity. “The evolution of complex cell types has been a long and complicated process that is poorly understood. By using new methods to obtain genome data from microbes that cannot be grown in the laboratory, we identified a new archaeal group that is related to the host cell from which eukaryotic cells evolved. These are very exciting times,” says Thijs Ettema at the Department of Cell and Molecular Biology, Uppsala University, who lead the scientific team that carried out the study. In 2015, Thijs Ettema and colleagues published a breakthrough study in which genomic data was described for ‘Loki’, an archaeon living in the ocean floor that represented the closest living micro-organism of complex cellular life. In the current study, which corroborates these previous findings, several new Loki-related archaea are described. “These organisms are our closest microbial relatives, and we know next to nothing about them. Current methods allow us to take a first genetic sneak peek. It is really exciting!‘’ says Thijs Ettema. “Our findings are based on analysis of genetic material that was directly obtained from the environment. We have actually never seen these cells”, says Jimmy Saw, researcher at the Department of Cell and Molecular Biology, Uppsala University, and co-lead author of the paper. “We named these new archaea Thor, Odin and Heimdall after the Norse gods, and together with Loki, they form the Asgard archaea. Interestingly, these new groups are found in various environments all over the world, and not only in the deep sea, as Loki. So far they are most abundant in sediments,” says Eva Fernandez-Caceres, co-lead author from Uppsala University. 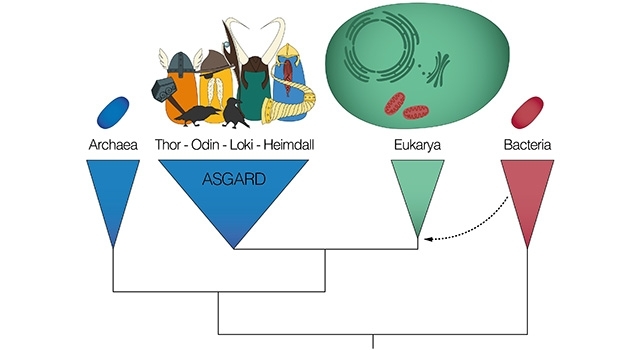 “We found that Asgard archaea share many genes uniquely with eukaryotes, including several genes that are involved in the formation of structures that give eukaryotic cells their complex character. Such genes had thus far only been found in eukaryotes, indicating that these archaea were somehow primed to become complex. However, the picture is far from being clear on exactly how this could have happened,” says Anja Spang, researcher at the Department of Cell and Molecular Biology, Uppsala University. “It would be great if we could isolate or grow Asgard cells, and study them under the microscope. I am convinced that this will reveal more important clues about how complex cells evolved. Ultimately our microbial ancestry will be uncovered,” concludes Thijs Ettema.